I ran across the headline while researching a client project. I don’t know who said it, but it immediately hit home because I’ve always believed that good questions are powerful tools in business and in life. They give us direction, challenge us to think differently, and help us get back on track when we we get distracted. It was a fun challenge to write a blog post about questions that you can use to help with marketing, business strategy, motivation and more. This is just the start. I plan to add to this list, so please suggest questions you think I should add. Every marketing plan has to address how a company will position itself in the market. There are lots options, but I prefer the KISS approach. The questions are straightforward yet answering them can be quite hard. I like the NPS because it focuses on customer loyalty as opposed to customer satisfaction. Research shows that even satisfied customers are likely to leave you for a competitor. The right questions are important when brainstorming new marketing initiatives or kicking off discovery with a new client. I found these questions in Simply Better — Winning and Keeping Customer By Delivering What Matters Most by Patrick Barwise and Seán Meehan. They got them from Stephen King at J. Walter Thompson. I like these questions because the address everything from an assessment of current conditions to how you plan to measure success going forward. These five questions could easily fill a full day of conversation. Here’s one of our favorites at Amy Atkinson Communications. What can you be best in the world at? The answers will lead to a powerful focus for your business and your marketing. The Business Model Canvas is a framework for planning a new business and explaining your existing business clearly to others. 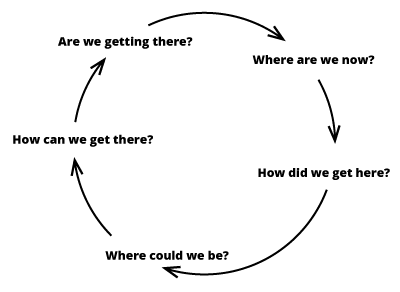 The model includes nine parts, each of which has a series of questions to explore. Customer Segments — For whom are we creating value? Who are our most important customers? Value Propositions — What value do we deliver to the customer? Which one of our customer’s problems are we helping to solve? Which customer needs are we satisfying? What bundles of products and services are we offering to each Customer Segment? Channels — Through which Channels do our Customer Segments want to be reached? How are we reaching them now? How are our Channels integrated? Which ones work best? Which ones are most cost-efficient? How are we integrating them with customer routines? Customer Relationships — What type of relationship does each of our Customer Segments expect us to establish and maintain with them? Which ones have we established? How costly are they? How are they integrated with the rest of our business model? Revenue Streams — For what value are our customers really willing to pay? For what do they currently pay? How are they currently paying? How would they prefer to pay? How much does each Revenue Stream contribute to overall revenues? Key Resources — What Key Resources do our Value Propositions require? Our Distribution Channels? Customer Relationships? Revenue Streams? Key Activities — What Key Activities do our Value Propositions require? Our Distribution Channels? Customer Relationships? Revenue Streams? Key Partnerships — Who are our Key Partners? Who are our key suppliers? Which Key Resources are we acquiring from partners? Which Key Activities do partners perform? Cost Structure — What are the most important costs inherent in our business model? Which Key Resources are most expensive? Which Key Activities are most expensive? If you are more interested in more detail, I highly recommend Business Model Generation by Alexander Osterwalder and Yves Pigneur. There are also a number of templates that your can find online to help you build your Business Canvas. How complete is your company’s vision and understanding of the market? What is your ability to execute your vision? This concept is helpful if you need a quick marketing analysis of your company versus the competition. It’s one of most famous studies about goal setting. You may have heard it. In 1979, interviewers found that 3% of Harvard MBA graduates had clear, written goals and plans to accomplish them. Ten years later, they interviewed the same group. The 3% who had clear, written goals were earning, on average, ten times as much as the other 97% put together. What are my goals? What do I have to be, do, or have? What are the benefits of reaching my goals? What major obstacles stand in the way to my achieving my goals? What skills or knowledge do I need to achieve my goals? What individuals or groups do I need to work with to achieve my goals? What is my plan of action to achieve my goals? When will I complete this goal? I know that I’ve run across similar questions in the works of Zig Ziglar and Brian Tracy. I highly recommend Tracy’s Goals if you want more detail. What price am I willing to pay to achieve my goals? We’ve all been in bad brainstorming sessions that devolve into arguments about one person’s opinion versus another person’s. That happens because the participants are talking in different contexts. 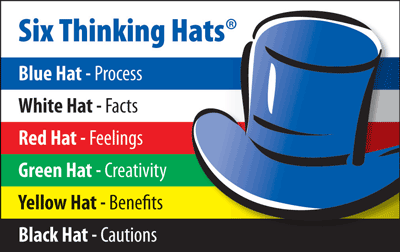 Edward de Bono designed his “Six Thinking Hats” to improve brainstorming by asking questions in planned contexts. The gist is that everyone in the group wears a chosen hat at the same time so everybody is tackling the problem, challenge or idea from the same perspective. Each hat has a different color that represents the selected context. The Blue Hat is for opening and closing your brainstorming session — What is the problem we are trying to solve? Why do we need to solve this problem? What are the ground rules? What have we achieved so far? Are we making progress? What have we learned? The White Hat focuses on data and know facts — What information do we have? What information do we need? What information is missing? What questions do we need to ask? How are we going to get the information we need? Is it fact or belief? The Red Hat focuses on gut reactions and intuition — How do you react to this? What is your intuition/opinion about this? Gut feelings…hunches or insights…likes/dislikes? What emotions are involved here? The Black Hat is logical, careful and cautious — What will happen if we take this action? What can go wrong if we proceed with this idea or implement this suggestion? What are the weaknesses that we need to overcome? How does this “fit” with our experience, policy, strategy, values, ethics, and resources How will people respond? Will it work, be profitable and be acceptable? The Yellow Hat deliberately looks for the positive in the idea — What ideas, suggestions, or proposals are there for how to approach this problem or achieve this goal? What is the merit of the approach? What positives can you see in this idea? What could be done to make this work better, faster or more economically? Under what conditions could this work? What would it take to make this proposal acceptable? What is your vision for how this could work? The Green Hat stands for innovation and creative ways of approach the problem — What are some fresh ideas or approaches? What are all of our alternatives here? This idea won’t work in its present form, but can we shape it or adapt it so that it might be usable? Do we always have to do it the way we’ve done it? The right questions can jumpstart your day and put you in the right frame mind. I found these seven questions from Tony Robbins and have incorporate them into my daily routine. What am I most happy about in my life now? What about that makes me happy? How does that make me feel? What am I most excited about in my life now? What about that makes me excited? How does that make me feel? What am I most proud about in my life now? What about that makes me proud? How does that make me feel? What am I most grateful about in my life now? What about that makes me grateful? How does that make me feel? Who do I love? Who loves me? What about that makes me loving? How does that make me feel? I plan to add to this list. 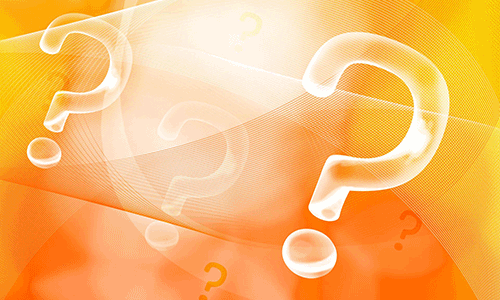 What questions inspire you or help you tackle challenges at work and in life? Amy Atkinson Communications is a Nashville-based integrated marketing firm that specializes in strategic planning, counseling and campaign management.